Guard locking switches are designed to provide robust position interlock detection for moving guards and provide a lock mechanism to keep the guard closed until the hazard has been removed. They are tongue operated and are designed to fit to the leading edge of sliding or hinged machine guards to provide positively operated switching contacts and provide a tamper resistant key mechanism that is not easily defeatable. Depending upon the risk assessment for the application, they can be used independently to provide positively operated contacts to EN60947-5-1 or they can be used in combination with any dual channel safety monitoring relays to provide up to PLe Category 4 to ISO13849-1 or SIL3 EN62061. They are offered with a choice of various actuators to aid installation and maintain durability throughout the rigorous applications of Factory Automation, Packaging, Food Processing, Pharmaceutical and Petro- Chemical Industries. The switch is rigidly mounted to the frame of the guard or machine. The actuator is fitted to the moving part (frame) of the guard and is aligned to the switch entry aperture. The actuator profile is designed to match a cam mechanism within the switch head and provides a positively operated interlock switch. When the actuator is inserted into the switch the safety contacts can be closed and allow the machine start circuit to be enabled. When the solenoid receives the required signal the safety contacts are positively opened, the machine circuit is broken and the guard door can be opened. They can be used in combination with safety timers to provide a delay before allowing the guard to open (e.g. for machines which require run down). Standard versions automatically spring lock at the insertion of the actuator and will only unlock when power is applied to the solenoid. These switches are sealed to NEMA 6 (IP67) and provide long term protection against moisture ingress. 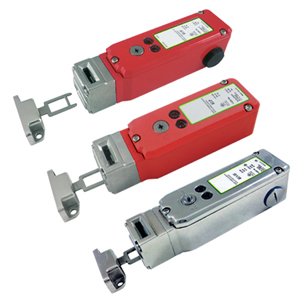 Note: *KLM, KLP and KL3-SS Series guard locking safety switches (switch only, actuator sold separately).